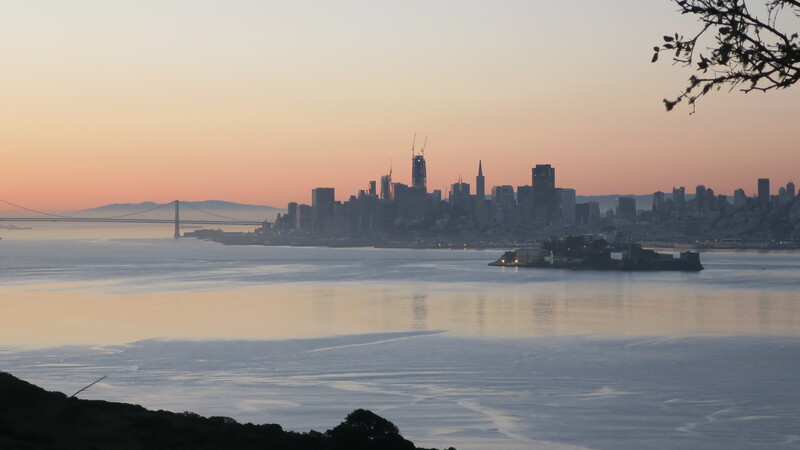 San Francisco Bay’s Angel Island served as a Native American hunting area, an Army Base, the West Coast Ellis Island, and a Nike Missile Base. Today, Angel Island is a California State Park. I recently backpacked ~2 miles with four boys & several parents to our campsite. 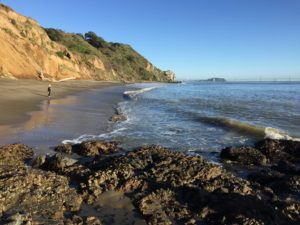 During our weekend trip we hiked to a deserted beach, climbed the flanks of Mt Livermore, and completed the excellent Angel Island Junior Ranger book. The island is remote, has world class views, and an excellent place for young backpackers. The toughest part is making the reservation. 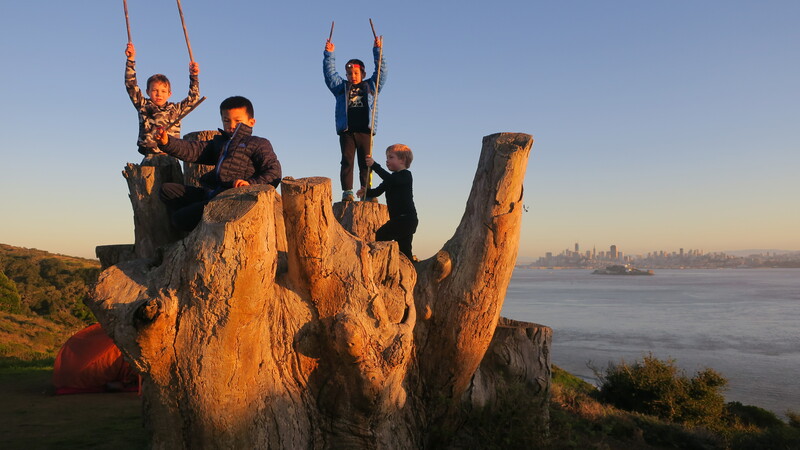 Angel Island backpacking with kids is world class and one of the best urban outdoor locations in North America. Every Angel Island tour requires a boat ride. 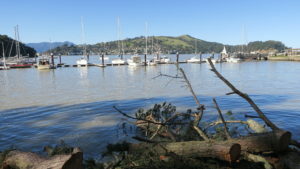 We took the 1:00 Ferry from Tiburon. Mother Nature assisted the trip with a sunny weekend after eight days of constant rain. We saw many down trees along the route. 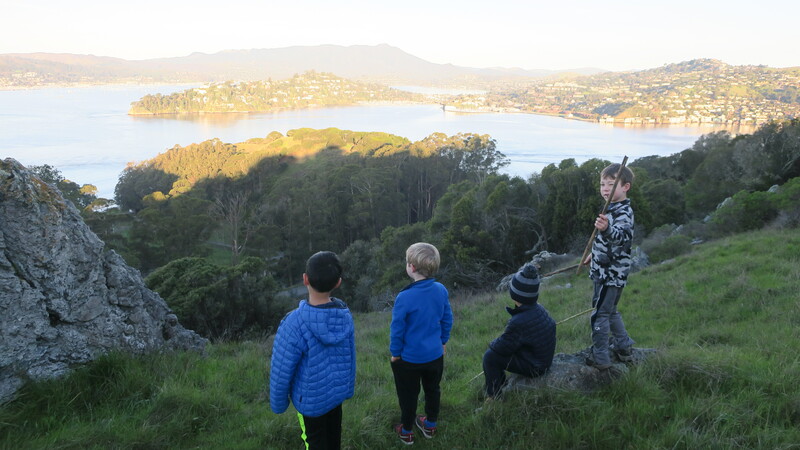 We followed the ring road around Angel Island to our campsite. Many Monarch butterflies greeted us on the hike as they prepared for their migrations north. As we reached the southern part of Angel Island, the views transitions from Marin & Mt Tam to the Golden Gate Bridge, San Francisco, and the Bay Bridge. 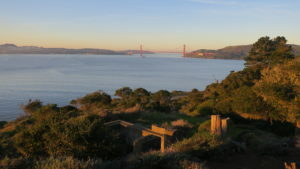 Angel Island has many older military bases. This bunker lay next to our campsite where the boys found a deer skull. During the trip we saw the largest mammals on the island including deer, raccoons (at dusk), and sea lions. After setting up camp, we hiked to a remote beach. Althought it lacked a buried Statue of Liberty, the beach had a Planet of the Apes feel. The beach is deserted with some flotsam from SF Bay, and is bordered by a small wood shelter and tidepools. The sunset was special, but the sunrise was spectacular. The bunkers & trees created provided many spots places to climb. 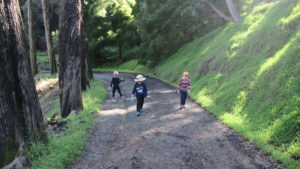 The next morning, we followed use trails up the sides of Mount Livermore. After realizing that we could not catch the deer we saw in the distance, we headed back to camp and the ferry. Angel Island Backpacking with kids or without is recommended for all. The State Park offers world class outdoors in the middle of the 6th most populous area in the United States.